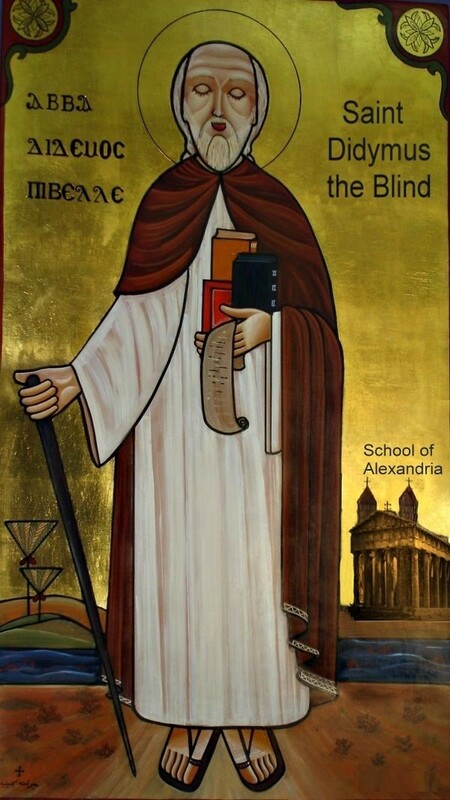 Didymus of Alexandria (310-395), also called “the blind,” was born in Alexandria and lost his sight from the age of 5. He was a very well versed scholar, fond of Plato and Aristotle, and was the head of the catechetical school of Alexandria for many decades. He was a revered teacher and even Saint Jerome and Saint Anthony the Hermit, so said the tradition, wanted to listen to his classes. Didymus was a follower of Origen, the great Christian thinker that was not without reproach from the point of view of orthodoxy. Didymus also was condemned as a follower of Origen in some of his theological mistakes. He wrote many works, also appreciated by Saint Jerome and by Pope Damasus (Jerome, at a certain time of his life, was the secretary of pope Damasus). He was not a priest or a monk: “Didymus always remained a layman. The idea that he was married rests on a mistaken identification of him with a Didymus to whom one of the letters of St Isidore of Pelusium is addressed. He seemed on the contrary to have lived the life of an ascetic, although in the city and not in the desert. A curious story was told by him to Palladius. One day, when dwelling on the thought of Julian as a persecutor, and on this account having taken no food, he fell asleep in his chair and saw white horses running in different directions, while the riders cried out, ‘Tell Didymus, today at the seventh hour Julian died; arise and eat, and inform Athanasius the bishop, that he may also know it.’ Didymus noted the hour and the month and the week, and it was even so” (Chapman, J. (1908). “Didymus the Blind.” In The Catholic Encyclopedia: http://www.newadvent.org/cathen/04784a.htm). Apokatastatis is a Greek word that in the doctrine of Origen means the restoration of the universe in its original state. This doctrine teaches that basically there is no eternity of punishment and that at the end all will be saved: “The doctrine of the apokatastasis is not, indeed, peculiar to St. Gregory of Nyssa, but is taken from Origen, who seems at times reluctant to decide concerning the question of the eternity of punishment. Tixeront has well said that in his De Principiis (I.6.3) Origen does not venture to assert that all the evil angels shall sooner or later return to God (P.G., XI, col. 168, 169); while in his Comment. in Rom., VIII, 9 (P.G., XIV, col. 1185), he states that Lucifer, unlike the Jews, will not be converted, even at the end of time. Elsewhere, on the other hand, and as a rule, Origen teaches the apokatastasis, the final restoration of all intelligent creatures to friendship with God” (Batiffol, P. (1907). “Apocatastasis.” In The Catholic Encyclopedia: http://www.newadvent.org/cathen/01599a.htm). Of course a doctrine as such was seen, correctly, with suspicion by the defender of orthodoxy, even if we may see that it was basically revived century after century until our own days. Previous PostBITE-SIZE THEOLOGY (17) – What does “Sacred Tradition” mean? BITE-SIZE THEOLOGY (29) – Can faith alone save us? WE ARE EASTER PEOPLE – Christ always wins!